Two years after going down in the Internet history by going viral with their dance-off, the burrowing owls are back with a fire tandem routine. 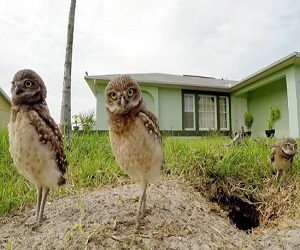 GoPro has released the part II of the owls dance-off, shot by wildlife photographer Megan Lorenz, who set up a GoPro camera on her lawn. The video features the birds nodding and bobbing their heads, stretching and interrupting for a second their “show” to pass from one another a grub and put it into their nest. The track playing in the background is “Earthquake” by Viramaina.